Fallout returns this year with a new team behind the radioactive wheel. 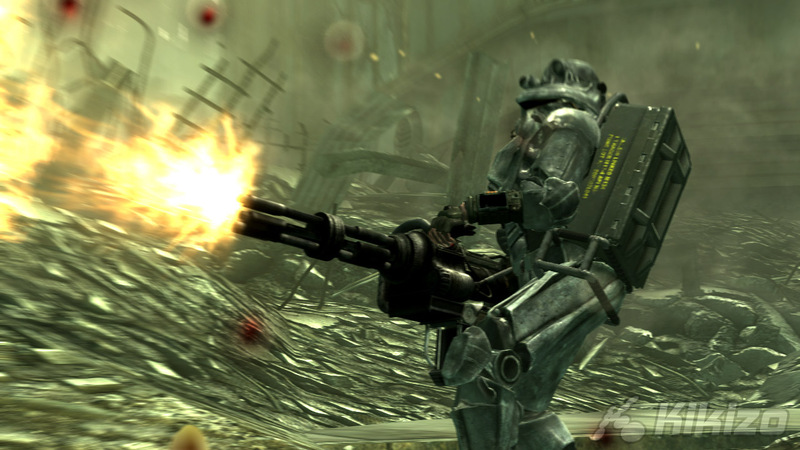 We sit down with Bethesda's Pete Hines to find out more. 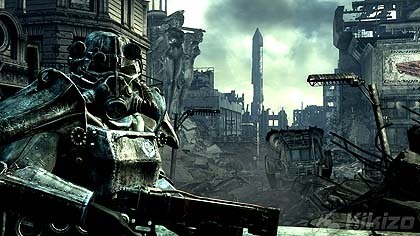 Life in Fallout 3 begins at the beginning. Literally. The game starts at the moment of birth and right away it's clear that the developers have thought of ways to get around the trite character creation process found in so many other RPGs. Your father, played by Liam Neeson, asks the nurse if it's a boy or a girl, and a pop-up appears on screen, allowing you to choose. It doesn't matter too much what you answer. As Hines tells us, playing as a woman or a man "is more of a flavour thing than a change in the game thing." The dialogue plays catch-up in these early stages, taking cues from your answers and the limited actions you're allowed. Your father pulls out a gizmo that shows off how you'll look when fully grown, giving you a chance to customize your character. There are presets you can use to get started and tools that allow you to fiddle as you please. And your choices have indirect effects too, altering the way your father looks so that your blood-link is visible. 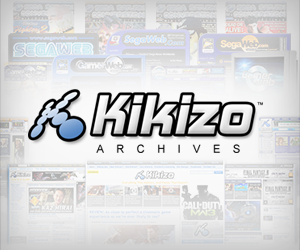 The first portion of the game is told during snippets of time. A few minutes at birth, some when you're one, and a few more here and there until your late teens. 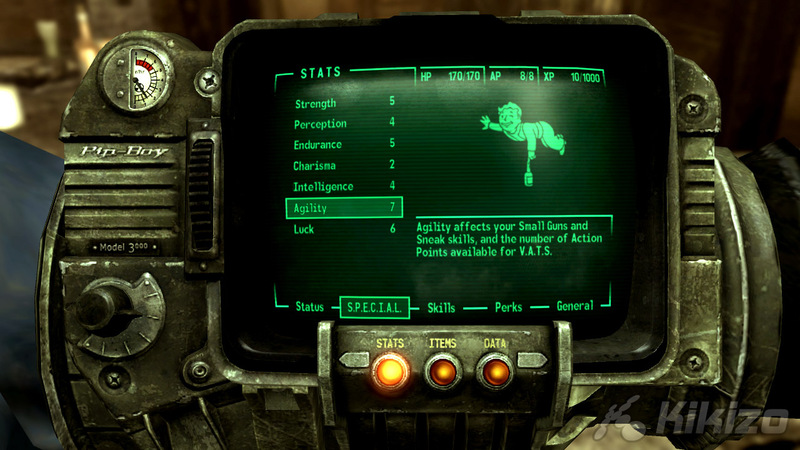 The second scene sees you, as a one-year-old, in a room in Vault 101. (The 101 was chosen simply because it looked cool on the Vault suits, says Hines.) Your father leaves you alone for a while, giving you an opportunity to escape your crib. There's a book titled You're SPECIAL on the floor. Pick it up and your journey into the statistics that form the technological heart of the game begins. The SPECIAL book allows you to assign points in seven categories: Strength, Perception, Endurance, Charisma, Intelligence, Agility and Luck. These numbers will form the soul of your character, and together with the karma you build up and destroy through your interactions with the world and the characters in it, they'll determine your experience of Fallout 3. The overall approach is novel, even though the result is not too dissimilar from Bethesda's own Elder Scrolls IV: Oblivion or other RPGs of the sort. But there's a persistence that we can't help but appreciate. Consider a scene that follows not long after the SPECIAL one. It's your 10th birthday and the residents of Vault 101 have come together to celebrate with you. There's a bully there who's after the sweet roll you got as a gift from a perky girl named Amato. Already here you can start to work on your life-long relationships with characters in the game, playing with the options available during the non-spoken dialogue. "When you have these situations, you can decide how you're going to work your way through in dialogue," Hines says. "It's almost like a little minigame. How do you want to respond, what are people going to do as a result of what you say?" Another flash forward and you're 19-years-old. Your father has left the safety of Vault 101 and it's up to you to find out what he's up to. We're shown a battle that appears to take place some time early in the game, though Hines won't say how far in. It's just a random encounter with some thugs in a junk yard. But there's an important element here: Dogmeat.